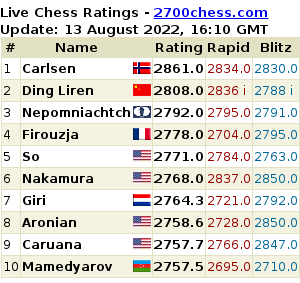 After the flood of tweets about game 8 on Wednesday, the chess twittersphere calmed down a bit. What will we remember most from game 8? The fact that Magnus did not show up at the press conference? Maybe. What we will remember is The Chess Quote Of The Year. @rewbeniofrota: “Karjakin has, at least, granted a world champion’s quotation “It is much better to play well than to play white”. Teymur Rajabov @rajachess thinks that it will be difficult for Magnus to come back: “Will be very hard for Carlsen, he has no opening advantage, no time advantage and no advantage in calculation, at the moment, nervous as well”. @cyberella: “I can’t believe we’re at move 20 after only 30 minutes in! It might all be over in an hour. Then again, it’s all theory.” Grandmaster Simon Williams @ginger_gm: “This looks more like a memory test then a game. Modern chess, don’t we just love it”. @joshfriedel: The Archangelsk leads to fascinating positions, but computers beat them to a pulp. Hope there is some tension still left. @nigelshortchess: It is one of the great ironies of chess that the sharpest variations are often the most boring”. Jonathan Tisdall agrees, @GMJtis: “Call me crazy, but I find long sharp theoretical battles the boring games. (You don’t have to call me crazy)”. What can you do in 30 minutes? Not a stellar move, just the solid 23…Rfd8. What do you think @fabionacaruana: “This variation won’t offer Carlsen many (or any) winning chances, but he should be able to hold it without many problems”. elgransenor1: “Depressing how many engine moves they are playing. Chess is getting slowly strangled and turned into a soulless activity”. @reachvsara: “Finally a sac in dis world chesschampionship! In footsteps of Kasparov & Vishy. Lets continue to have faith in humanity”. @jumarear:” I think everyone saw a winning position after Bxf7 but no one actually saw the winning combination”. @cyberella , are you still awake? “I keep on staying up too late to watch games that lead nowhere. Wrap it up already, guys! Some of us have to work tomorrow”. “Following Carlsen – Karjakin is becoming a serious obstacle to being able to get out of bed in the morning.”, according to @wordssavant. And finally, the inevitable happened: TarjeiJS: “OFFICIAL, Karjakin-Carlsen drawn. Magnus keeps his chances alive exactly 2 years after he retained his WC title in Sochi”. @redfoks10: “Instead of saying Carlsen is not on his best, maybe it’s time to say that Karjakin is better than we all thought”. What to expect for game 10? eli_1985_mor: “Tomorrow we will see either the best game or the worst game of the match in terms of quality”.